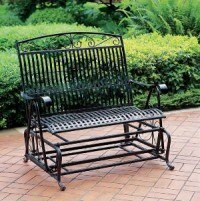 A metal glider bench can be a beautiful and highly functional addition to your garden, patio or landscape. 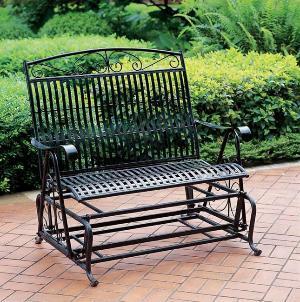 A wrought iron glider bench can add a rustic feel or an old world charm to your décor. On top of all that, you will be creating a very comfortable and relaxing place to sit; making your garden or patio the perfect place for you to spend with alone or with your loved ones. As with any other type of bench, metal glider benches are available in different sizes and designs. One of the main benefits of metal glider over a wooden glider is that they are more durable and highly resistant to the harmful effects of the wind, sun, rain, and snow. They are also less likely to need maintenance and often maintenance only includes a new coat of paint. If you do choose a wrought iron bench, repainting is not necessary because they do become more beautiful over time. The material gets a silver antique finish that is both charming and appropriate for any outdoor design. If you are some people and feel that metal material is plain and lacks some of the warmth of a wooden glider, there are many ways in which you can enhance the bench to make it feel and look more inviting and comfortable. One of the most popular ways in which you can spice up your plain metal bench is by adding an attractive canopy over the bench. Canopies are available in different materials but again, the most popular is metal. The platinum canopy that is sold in kits at any hardware store would be a perfect solution. Most can be assembled easily within a few hours using basic tools. Most kits come with the assembly guidelines so you can do it even without help. Another way to accentuate your metal glider bench is by adding soft and colorful pillows that provide a striking contrast against the hard surface dark colors of the bench. If you have decided to add a bench in your garden, you can choose colors that match or blend well with the flowers in your garden or you can choose warm colors such as yellow, red, orange and tangerine. A little imagination can go a long way in making your glider bench more interesting, comfortable, and inviting. You should also consider adding a few different types of comfortable seating options especially if you plan to entertain in the space. A Strathwood chaise lounge is a perfect addition that will bring an entirely different level of comfort to the area.